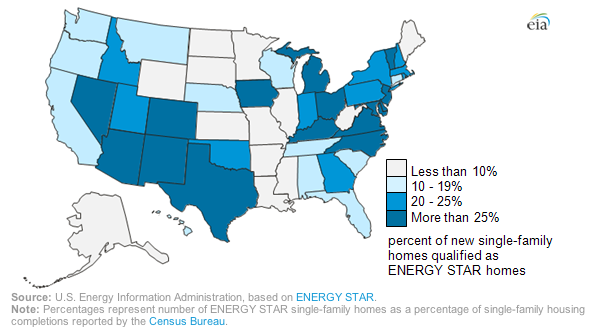 The above map shows the fraction of new houses that are Energy Star rated according to the EIA. Overall, 26% of new construction is energy-star rated. A summary of the current requirements is here. It's amazing to me that we in the US still haven't done basic things towards dealing with climate change like mandating that all new construction meets strict energy-efficiency requirements. The future of farming according to John Deere. The recovery in the US heavy truck market. Why would you do that: you're the land of the free, no? More seriously, if building new stuff with decent energy-efficiency would save folk money, you'd have hoped they would just get built that way, because folk would want them. It's interesting to me that truck sales over the past 40+ years have been so constant, with no overall upward slope as the population and economy have grown (or downward slope for that matter.) It looks purely cyclical. I guess increasing truck durability and market saturation has balanced the increasing reliance of a steadily growing economy on trucks.